With all the usual complaints about London being too hectic, expensive and unfriendly we can sometimes forget that there are a lot of things in this beautiful city that bring people happiness. Our volunteer Cambria Minott shares her favourites in this blog post. If you are coming to London for our conference, you may want to check out one of these happy places!Living in a city can be draining at times, but I love seeking out the ever-evolving pockets of whimsy and wonder that snap me out of the weekday routine of home-tube-work-tube-home. With endless free exhibitions, popups, and artistic, musical & foodie delights, I can't help but marvel at the magic of this city. Below I've shared five of my favorite spots that always inspire my inner child to enjoy London at its best. Some of my favorite moments in London have been at the top of the hill on the Heath, flying kites and sharing picnics with friends. In warm weather (and cold if you like it brisk! ), a swim in the ponds among the trees is physically and mindfully rejuvenating. During the winter on a rare snow day, Hampstead Heath is the best for sledding: a bin lid will do the trick. And within walking distance to the park is poet John Keats' house, where it's easy to get lost in Romantic reverie reading his love letters to Fanny Brawne. Free morning yoga in their outdoor 'Scoop' amphitheatre, dance lessons, film, music, theatre, all with the beautiful backdrop of the Thames and Tower Bridge. Food trucks are always swinging by, and Borough Market is just around the corner for foodie heaven. The name says it all! The MoH peeps are experts on how to be happy, and I can't help but smile when I visit them at the Canvas Café. They welcome everyone into their lovely space with classes in yoga, mindfulness and meditation. 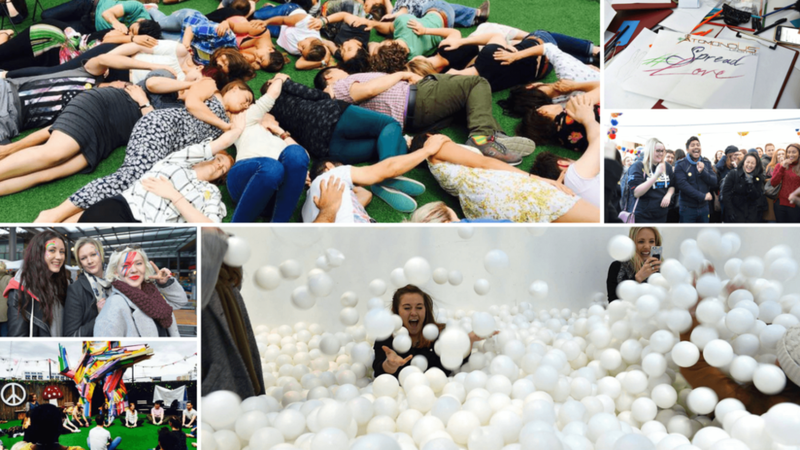 Keep an eye out for their happiness-focused events around London (they had laughing yoga and a ball pit at the last one!). A bit on the pricey side, but I think it's worth splurging a bit for for one of these quirky down-the-rabbit-hole adventures. Curiosity-piquing teasers are emailed leading up to the event, and the meeting spot is released on the day, always somewhere on the 'ginger' overground line. Their nomad dinners are immersive beyond imagination: I've witnessed an alien dance party, climbed through the jungle to escape a tiger, enjoyed a chat in a Singaporean noodle house, joined in a group birdsong chorus, and been served dinner by a robot. I leave with my eyes, palate and mind captivated, and I couldn't recommend it more! I love visiting the Royal Festival Hall for free theatre performances, dance lessons, markets and rotating art installations lining the riverfront. It's fun exploring Hayward Gallery, watching skaters do their thing in the skateboard park, seeing children splash and giggle in the fountains, checking out what's playing at the British Film Institute (and exploring their speakeasy-style bar, complete with faux bookcase entrance and overstuffed sofas). Further east just a few minutes along the river, there are wonderful, mysterious treasures to be found beach-combing on the riverbank. These are just a few crumbs in light of the many wonderful places London (and the world!) has to offer. I’d love to know, what's your favorite spot to explore, eat, dance, do yoga, meditate, and be happy?